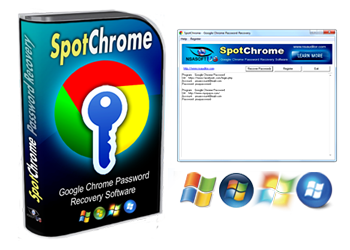 SpotChrome Password Recovery is a lightweight and very easy to use software solution for recovering passwords, user accounts and other critical business information stored in Google Chrome web browser. Google Chrome Password Recovery is a lightweight and very easy to use application that will help you to decrypt the passwords stored by Google Chrome browser. SpotChrome is the best and easiest to use toolkit to recover Google Chrome passwords. Like other browsers Google Chrome also has built-in login password manager which keeps track of the login passwords to all visited websites. With SpotChrome you can recover all passwords stored by Chrome Web browser. The displayed sign-on information can then be copied to the clipboard and saved to a file in standard text format. All the mentioned features are provided with a user friendly graphical interface. With Google Chrome Password Recovery you can retrieve user names and passwords saved in Google Chrome. Google Chrome Password Recovery is the easiest to use toolkit on the market. We deliver highest quality and stable programs. We grant you unlimited 24 / 7 support. You'll get all future versions for free. Your software license is yours to use FOREVER. No monthly, yearly charges, you pay just a one-time Ordering price! How i can Recover Accounts Passwords? With SpotAuditor you can rocover Facebook, Twitter, Google Plus+, LinkedIn, MySpace, LiveJournal, Pinterest, Badoo, myLife, Friendster, Bebo, Zorpia, Netlog, hi5, PerfSpot, Orkut, AOL, Yahoo and more accounts passwords. How i can Recover My eMail Passwords? You can recover Microsoft Outlook Express, Microsoft Office Outlook, Gmail, Hotmail, Yahoo! Mail, Zoho Mail, iCloud Mail, AIM Mail, Mail.com, FastMail, Shortmail, BigString.com and more passwords with SpotAuditor Password Recovery Software. How can I unmask a password hidden behind asterisks? Asterisk Password Uncover utility can reveal the passwords stored behind the asterisks in password text-boxes, dialog boxes, web pages and ActiveX controls.